As winter continues around me all I want to do is cuddle up in my bed and stay super warm. I must admit, a well dressed bed is important to me….I see this as an affordable luxury. And although I may not spend as much time in bed as I would like, the time I do spend there is comfortable and cozy every night! As I want to care for my bed linens to make them last longer and be as soft as possible here are some great tips that I picked up from ELTE when I was last in their linen department. 1. Wash linens separately from anything else, particularly items that contain polyester. Polyester “pills” and will shed its pilling on natural fibers lowering the smoothness and softness of the fabric. Select a gentle laundry detergent. Products with whiteners are not recommended on coloured linens as they may progressively fade the colours. 2. Certain hair and skin care products that contain oxidizing agents (eg. lotions for acne) may cause discolouration of sheets so if you use these be sure to cover your pillow with a white pillowcase or towel. 3. Launder towels in warm water and gentle detergent. It is very important with towels that you do not use fabric softener as it will decrease the absorbancy of the towel so that eventually it will make your towels water resistant. Over time, the softener builds up on the surface of the towel and will not be completely removed during the regular rinse cycle. 4. 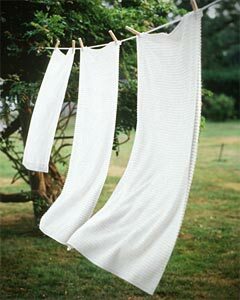 Line drying any linen is by far the best for it and the environment but if you use your dryer its key to not OVER DRY your towels or sheets. Set your dryer on permanent press, which has a cool-down cycle at the end that helps reduce wrinkles. Or use just an ‘air cycle’ that simply air-tumbles its contents without any heat. Remove linens promptly from the dryer to reduce wrinkling. Smooth them out, finger pressing details like flanges on pillow shams, borders on flat sheets, edges of table clothes or napkins. then fold carefully. 5. When washing terry towels, wash separated into light and dark colours. It’s best to wash towels before use as this starts the ‘breaking in’ process, making them softer and more absorbent. Several washings are required for 100% cotton terry towels to achieve their maximum absorbency, softness and fluff. If a loop of terry gets snagged, don’t pull on it. Each loop is individually knotted and simply requires trimming with scissors.